What's New at American Literature? 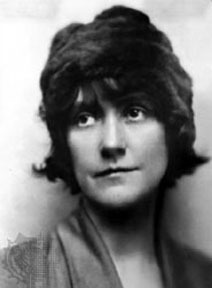 Susan Glaspell . . .
One of the benefits of managing this web site is the continual discovery of new authors and bodies of work that were previously unknown to me (even if widely known to others). Susan Glaspell is one of those authors that was well known during her time, and it seems like I should have learned about her earlier, but somehow I did not. Even during her time (1876 - 1948), Glaspell was considered a great playwright and a gifted dramatist. She founded of The Providence Players theater company in Provincetown, MA along with her husband George Cram Cook (aka “Jig" Cook). While her plays are probably well known to theater enthusiasts, many modern readers have never heard of her. Those that have often encountered her as part of a Women’s Studies course or a class in feminist literature in an American university. The short story A Jury of her Peers has been featured on this site for a long time, but I did not realize until recently that the it was a derivative work of Glaspell's play Trifles, repackaged as a short story. When I discovered that, I read the play and enjoyed it a great deal. I am an OWG ( Old White Guy ) -- well not that old but in popular culture that seems to be the one-dimensional dustbin where wayward Progressives would have me cornered -- and have been around long enough to observe both the mindful* and mindless practice of feminism. The portions of Glaspell’s work that I have read are definitely of the mindful variety. Importantly, they are also easily approached and accessible to men. While that is probably a part of the question that many feminist practitioners don’t often consider, I'm of the opinion that reaching the other half of the population, rather than scaring them away -- even if inadvertently -- is a good thing. Kate Chopin’s The Story of an Hour is an example of a great literary piece that makes an important point, but also has some uncomfortable binary (good/bad) implications from which many men may emerge more uncomfortable than enlightened. While Trifles has some one-sidedness to it, it is well within reasonable proportion and Glaspell used it to make her point effectively. I feel that it's an arftul trade-off and therefore I don't consider it an imperfection. For me, the play comes across as thought-provoking. I also found it interesting to think about why she offered it as a stage production instead of a short story, and she used the tools of theater -- like costume and props -- to enhance the story, to move the characters in and out of physical proximity to emphasize the story line. Male or female, young or old, Susan Glaspell’s works are worth your time. If you are already a fan, I think you should revisit her work for new perspectives. If she is unknown to you, then you are lucky. It’s your chance to fall in love with a new author. So I heartily recommend that you go visit with Susan Glaspell and read her play Trifles. * I tip my hat to Camille Paglia for her recent defense of free speech as practiced by Duck Dynasty’s patriarch Phil Robertson. I am totally on board with your right and my right to say anything you want, no matter how potentially stupid and foolish it might appear to some. And I strongly agree with her characterization that the practice of “punitive PC", often used to punish any thoughts that do not align with Liberal standards and agendas as “utterly fascist." Those are strong words she used (she tossed Stalinist in there too). But I don’t think they are unmatched to the crimes committed by those that wish to be our culture and thought-police, and I wish they had a better sense of where their inclinations have consistently led throughout history. Some slopes are more slippery than others, and there's no push quite like the belief in the superiority and "correctness" of your own thoughts to get one started toward the ugly valley of unintended consequences. Once in motion, these types of movements are much harder to stop than they were to start. Practice tolerance. Please.